Business travel was never designed to be fun. Very often you find yourself rushing to an airport, getting off in another city, jumping in a cab, going to a hotel, meeting in the hotel's conference room, jumping back in a cab, and the next thing you know you are sitting in the office. You may have just visited one of the most beautiful, culture-rich cities in the world, and never even knew it. But the times, they are a changin'. 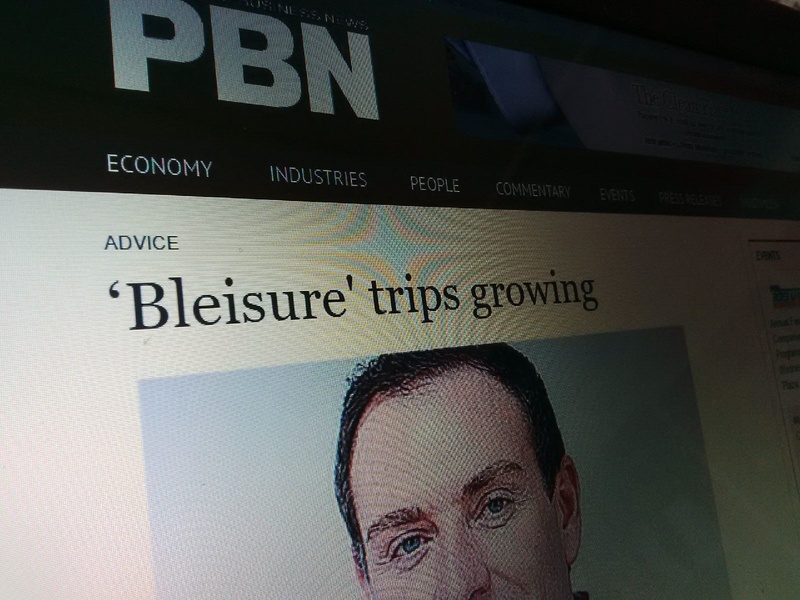 Many people who need to travel on business are becoming "bleisure" travelers, a term used to define professionals who mix vacation – or leisure – time with business. According to a BridgeStreet Global Hospitality report, 60 percent of travelers reported having taken bleisure trips, with 30 percent adding at least two additional days to their trip. Respondents said they do this because it limits the stress associated with business travel, making them more relaxed when away from home. And sometimes it's just to enjoy the city they are traveling to. As a travel-management company, we are seeing increasing amounts of clients extending their trips, and bleisure is fast becoming a way of life for the business traveler. Many see extending their work trips as a perk of the job. We find that when a business trip is extended with family or friends, the burden of travel is lessened and can make employees more willing to travel in the first place. We also have clients advising us that bleisure trips can be advantageous to the company as a whole, with staff gaining better knowledge of a city and its culture being good for business. In a survey of international travelers published last year, 60 percent said they've taken bleisure trips, usually adding two vacation days to work-related travel. Nearly half of them did so on most occasions, and six out of 10 said they were more likely to take bleisure trips today than they were five years ago. "It makes the stress of business travel more bearable," said Stuart Bruce, a British public relations adviser whose work frequently takes him all over the world. According to the BridgeStreet survey, bleisure travelers are almost evenly split male and female, with most falling into the 45- to 54-year-old age group. More importantly, the second-largest group was 25- to 35-year-olds, representing millennials. This always-on, app-connected generation is more apt to deploy a business-mixed-with-pleasure mindset. Tuned in to technology, they get comfortable in unfamiliar surroundings by using apps and social media to navigate, make connections, and choose restaurants. With all this in mind, it's evident that bleisure travel is very much becoming part of the business travel world, but how is it managed? We're still finding that many corporate travel policies don't allow for gray areas such as bleisure. The biggest questions are – who pays for the extra nights' hotel accommodation and the flights home? Each company has its own policy for adding on personal time. Some companies tend to discourage adding on vacation days. Others encourage it, if only to help employees overcome jet lag and be more effective while they work on the road. Taking it a step further, some companies even use the business-trip extension as a recruiting tool.